My youngest son has decided that he no longer eats cheese. This is the same son that last year would eat an entire box of macaroni and cheese. It really is hard to keep up with the food preferences of everyone in my house (my husband included). It has gotten to the point that it can change on a daily basis, especially with my oldest. If a friend of his decides that they don't like cheese, than he no longer likes it either. I can handle my own children, but it is almost an impossible battle once they start school and begin being influenced by outside forces. However, I am also stubborn and hold my ground, so I still serve cheese. I am a firm believer that my children eat the same meal that we do, if they don't eat they aren't allowed any of the homemade snacks that I make almost daily. That being said I also don't require them to finish their plate. They have to try at least everything that they are served. 99 percent of the time they eat the rest of their serving. The other 1 percent of the time they hate the dish and that is fine also. The one dish that my whole family loves is roasted chicken. Over the years my children have loved and hated almost every food except chicken. This week I tried a new recipe for Crispy Chicken Thighs with Pasta and Pesto from the January 2013 issue of Southern Living magazine. This recipe has 8 ingredients. It takes 45 minutes of total time, 15 minutes of which is active and makes 6 servings. I had no problems finding any of the ingredients at my local grocery store. Since I eat gluten free I did substitute gluten free rigatoni for the cellentini called for in the recipe. Additionally I used smoked paprika, I love the taste and it is great with chicken. I always use a stainless steel pan to make roasted chicken. It is great to put in the oven and you know when the chicken is browned since it will release (it will stay stuck to the pan until it is browned). It is the best way to get great crispy chicken, just make sure not to flip the chicken before it releases, you can always turn down the heat if you believe that the chicken is starting to brown too quickly. I followed the remainder of the recipe as written. The pasta under the chicken in this recipe was delicious. The pasta and pesto were my favorite part. The chicken was your average pan roasted chicken, which was very kid friendly and my children loved. The real star of the recipe was definitely the pesto, just make sure to adequately salt, it really will need it I promise. The pesto would also be delicious with chicken (either with or without skin). 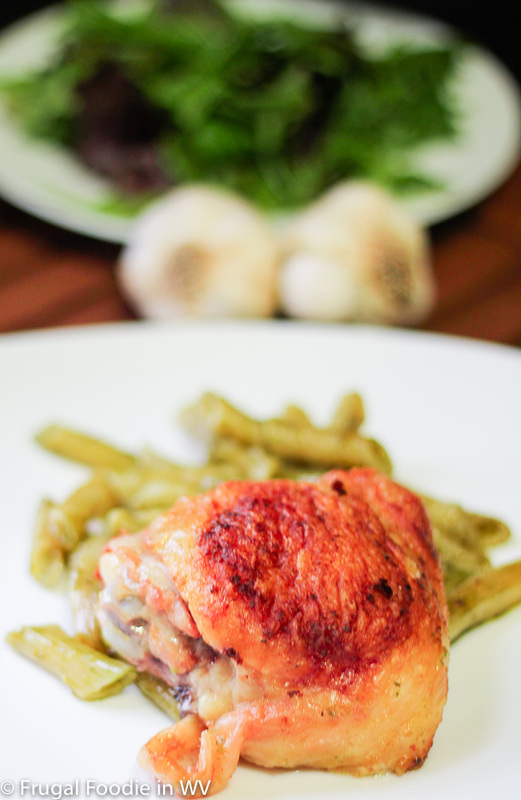 For the recipe go to Crispy Chicken Thighs with Pasta and Pesto. Thank you for joining my site, summdaysummway.blogspot.com I'm really happy you did. I know it's been a while since you joined but I'm just now finding the post. Feel free to visit again anytime you can. You also have some great recipes here. Thanks for the sweet comments :) Come back again soon!